Today (Monday, February 15, 2016), Special Economic Zone Authority in Duqm (SEZAD), granted Marina Duqm Company of the Golden Group a land usufruct in the Special Economic Zone in Duqm (SEZD) for the construction of a tourism façade. This would include hotels, mall, residential complexes, entertainment center, water amusement park and a number of other tourist services and facilities. H.E. Yahya bin Said bin Abdullah Al-Jabri, SEZAD Chairperson, signed the agreement on behalf of SEZAD, while Sheikh Salem bin Ahmed bin Mohammed Al-Ghazali, Chairperson of Duqm Marina, signed it for the investment company. The Tourist Façade Project includes three 5-, 4-, and 3-star hotels, a 4-star hotel suites and residential complexes comprising villas and apartments. The project also includes the construction of a mall with a range of restaurants, cafes, stores, water amusement park, a variety of different beach games, a mosque, a cultural and entertainment center, gardens, and public services and utilities. The project area will be about 741 thousand square meters at an estimated cost of about OMR 283,000,000 and its implementation will be in four phases, each of about four years. Upon completion, the project will provide about 800 jobs. H.E. Yahya bin Said bin Abdullah Al-Jabri confirmed that the Tourist Façade Project of Marina Duqm is a welcome addition to SEZD and will help stimulate tourism and enrich the tourist and resident because it will include a variety of tourism projects that keep pace with their aspirations. “SEZAD welcomes local investors and provides many incentives for investors. We hope to see more investment initiatives of the Omani private sector in Duqm,” asserted Al-Jabri. For his part, Sheikh Salem bin Ahmed bin Mohammed Al-Ghazali indicated that the vision of the Golden Group is to cooperate with the government to accomplish a variety of tourism projects to enhance the vision of the Sultanate and its position in the tourism sector. He praised SEZD features in terms of its strategic location overlooking the Arabian Sea in addition to being a promising tourist area that have the basic components to create a highly competitive tourist destination. 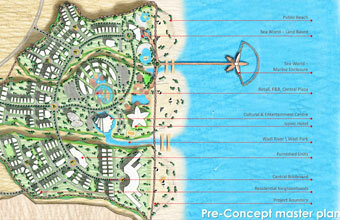 “These factors encouraged the Golden Group to take serious steps towards investment in Duqm. Through its new project, Marina Duqm Company seeks to provide a new concept of tourism in Duqm to meet the aspirations of the various segments of society therein,” added Al-Ghazali. Al-Sedrah Real Estate Company of the Golden Group would handle the real estate development of the Tourist Façade Project of Marina Duqm. It is noteworthy that the Golden Group has recently signed agreements with several international companies to develop and operate hotels of several categories in the various governorates of the Sultanate. Marina Duqm Company stated that it would review project implementation period and financial estimates within a comprehensive economic feasibility study including financial indicators for each stage.